We're just too nice out here. We won't ask you to coffee, we'll be nice to your face, but we won't invite you to the barbeque. And, we are too nice when we're driving. *Too* nice. And, this means we're unsafe, ironically. But that isn't actually true. We are actually safe drivers around here. Way safer than Virginians at least. 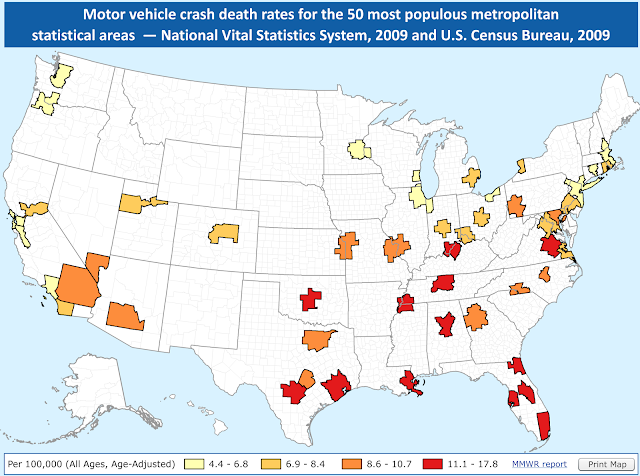 If you look beyond the data provided by All State Insurance in the linked article above, it's hard to find anything that points to Washington or specifically Seattle area drivers being unsafe. In fact, we consistently rank as one of the most safe. CDC stats are here for the metros (and I ranked them here) and an interesting study by the University of Michigan are here on statewide stats. So, this Washingtonians-as-nice-but-jerk-drivers things strikes me as a bit of anecdote becoming truth sort of thing. And, it's interesting that this and a lot of other similar stories are framed from the point of view from someone who came here from somewhere else. It seems to be a different angle on the Seattle Freeze vs. Cascadian Calm story. This is just about the nut of it. This story (and most stories about how we are as a regional personality) are told from the frame from people who are just arriving here. This is the same thing I noted when I wrote about the Cascadia Calm, which is in fact our regional personality. Something I noted back then was that searches and mentions of "the Seattle Freeze" correlates when there is a large influx of new residents to Washington. We don't talk about the way we are here when new people aren't coming to town. It only happens when new residents notice that people here have a different way of being. So, if you ask me, we're fine out here. We're not like other regions and we don't have to be. I'm not an aggressive driver and I don't have to be. I leave in plenty of time to get where I need to be.